This thing looks too cool for school! We are now offering the Effin-A Compensator 556 for Pre-Order at PredatorARMAMENT.com The most unique aspect of the EFFIN-A Compensator is the ability to fine tune and stack it for customized performance. 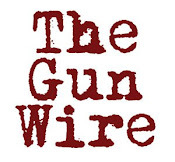 It was was designed to allow the end user the ability to adjust the manner in which the gas exits from the weapon. The EFFIN-A features 7 columns and 4 rows of exit ports that can be either opened or closed through the very simple use of set screws.The exit ports are not threaded completely through to eliminate the possibility of the screw being over turned into the chamber. This feature also allows the screw to "bottom out" increasing tightness and ensuring that it will not work itself out under the pressure of the gasses being released by the weapon. This Compensator also features the ability to "Stack" multiple comps end to end giving further options to the end user. 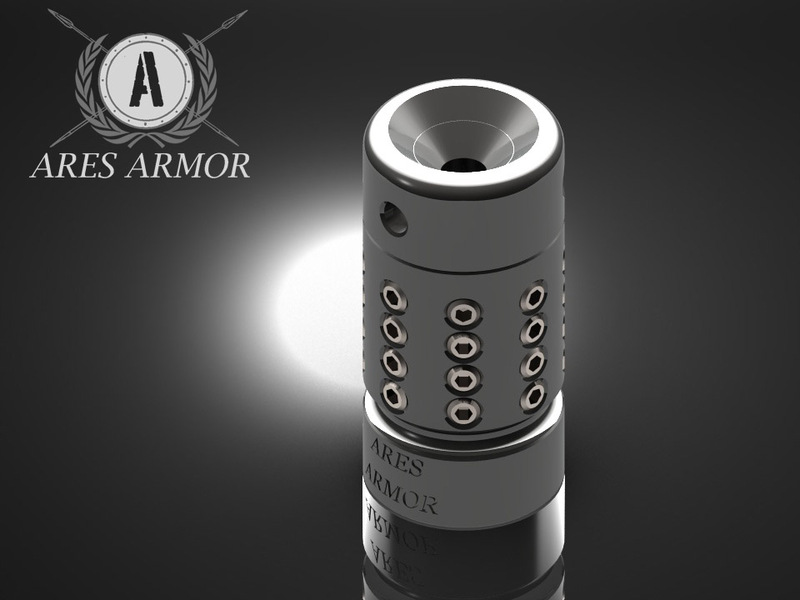 Muzzle climb is solved by this device in two ways; Ares Armor designed the comp with tunable exit ports, which act as an outside force that returns the weapon to a "position of rest". 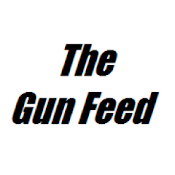 This outside force counters that of the weapon being fired where the shooter needs it most. This Compensator is also designed to directly increase the weapons moment of inertia by accurately counter balancing the mass of the front of the weapon in relation to the force of motion created by the outside force. 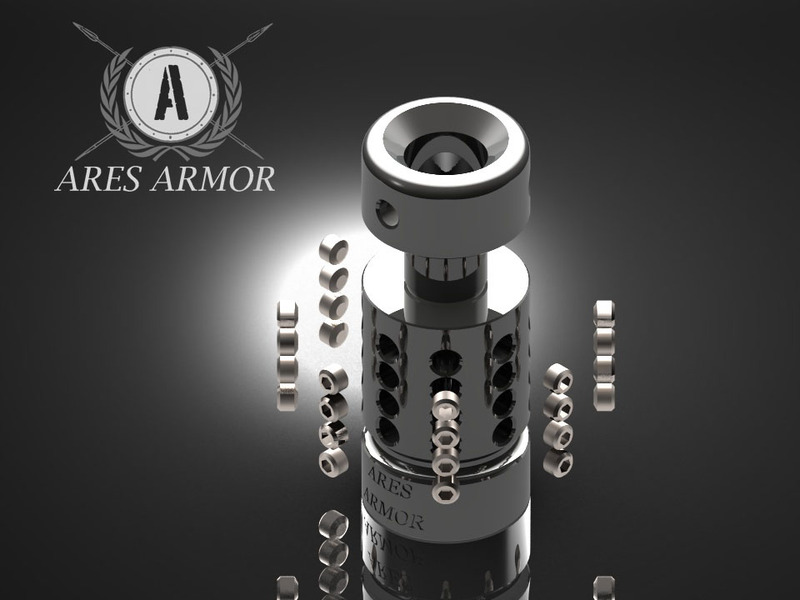 Due to the amount of time and money we spent on researching the amount of pressure released during the act of firing a round and adjusting the Compensator's balance to correspond to it, Ares Armor will not be releasing the exact weight until after the pre-order is finished and products have already shipped. Note: testing was conducting with two types of ammunition, Matchgrade and GreenTips. The general weight is between 4 and 5 ounces. The Compensator has an outer diameter of 1" and is 1.95" inches in length when the cap is removed. You have the choice of selecting the EFFIN-A Compensator in Black or Stainless Steel depending on which aesthetic appeals to you or fits best with your weapon. WARNING! If you attempt to modify or use these devices in any way attempting to create baffles for a suppressor, it will instantly void our warranty and possibly land you in jail. PLEASE OBEY THE LAW!We do not recommend stacking more than two of these on top of each other. If you do so, you do it at your own risk and it will also void the warranty. what kind of fore grip was that bald guy at the end of the vid using?